Morphic offers everything needed to create highly interactive applications in Pharo. It is however, difficult to find out how to actually create those applications. Morphic tutorials provide a starting point, and are not very good at showing how the different features interact and are supposed to be used together. Morph has lots of methods, and some of them are not in the method category where you might expect them. The result is that most Morphs in Pharo do not use much of what Morphic has to offer. Wouldn’t it be great if there would be some sample code, showing how Morphic can be used to great effect? Well, here is some code that takes a first step towards that goal. wells that support dragging a property towards a target. It shows how to combine drag-and drop with click: and context menu actions, and show to give UI feedback when over a well and when holding the mouse down over an element that reacts to click:. it will work with any morph that responds to #color: (like the world). By clicking on the plus, you can add more colors to the panel. The panel has a context menu to restore the default values. The people panel shows avatars belonging to an email addres. By default it uses gravatar for them, and caches the images. There are several things I would like to emphasize. I compared our solution with an “industry standard” one. We often think our system as being niche and perhaps not mature enough. We need to change that perception about our work. We build state of the art. One thing that I did not mention explicitly in the talk is the size of the implementation. The Spotter implementation is 3500 lines of code — and that it is so large because it currently comes with its own widgets. Furthermore, the extensions average 8 lines per custom processor (including the method header and the pragma). This is orders of magnitude smaller than what is typically out there, and it is precisely the reason why we can compete even if we are fewer. But, to get out there and compete we have to set that high goal for ourselves. For example, with GT we do not want to compete. We want to outcompete. So can you. While details are important, high goals require us to get away from those details. Only polishing details will tend to limit you to incremental improvements. We need to jump from time to time. But, these jumps are hard. On the one hand, it is hard to find the right jump and convince people to jump with you. On the other hand, they are hard to predict. For example, Spotter would have not been predictable one year ago. Yet, dry goals are not enough to keep us going. We need stories that make us dream. And the beauty is that Pharo breaths such a story. We should not limit ourselves to that story only. For example, with GT we want to reinvent the developer experience by making the developer be able to mold visual tools to her context because that is the only effective way to build sustainable systems. This little point of view will turn the IDE upside down, and this is only possible in a system like Pharo. Choose your high goal and tell its story through the system that you build. And remember that Pharo already offers a beautiful story to start from. I would like to announce that I developed a Sonar importer to get sonar data into a Moose model. It imports the list of metrics and projects available in the Sonar repository. On demand, it imports chosen metrics for all the projects. I let you see the tests and documentation to check the behavior of this importer. The configuration is on the Pharo catalog, so it is very easy to load it (else the repo is here). The importer is based on the public Sonar REST API Version 3.7.2, but should work with recent ones. Don’t hesitate to contribute if you want to add new features, the project is in public access! NeoConsole is a small, standalone package that offers a command line (a.k.a. a REPL) interface to a headless Pharo image. It contains a number of extendable commands and metrics that allow you to execute arbitrary Pharo code for result (introspection and debugging) or side effect (to manipulate the live, running image). There is a history mechanism, you can refer to previous evaluation results and there is a primitive describe mechanism (like a one level inspect). The metrics system allows you to consult a number of predefined values. There is decent error handling. The movie shows how to start from scratch, downloading Pharo, installing NeoConsole, running a headless image with the REPL installed in the background. Next, an HTTP server is added to the image and later a specific response is added as well. (You can speed up the movie, if you want). Obviously this has been done before, and this is not the definitive solution in this area. For example, readline support (allowing you to edit your input) would be fantastic. A true command line inspector and debugger would be super as well. These are standard features in Lisp and would be totally possible in Pharo too. I just needed this for myself, liked the result and thought it would be worth sharing. Security warning: this service opens up your image for access to those with access to your local network (i.e. those logged in to your machine), without any further authenication, allowing them to do absolutely anything. Think and make sure that you know what you are doing. nanomsg is a simple, fast socket abstraction library that supports many communication patterns (“scalability protocols”). NanoStrand is a gate to the nanomsg world for Smalltalk users. Since there are many language-bindings for nanomsg, integrations with other network programs would be much simpler via NanoStrand. The project page includes a nice description on how to use it in Pharo. 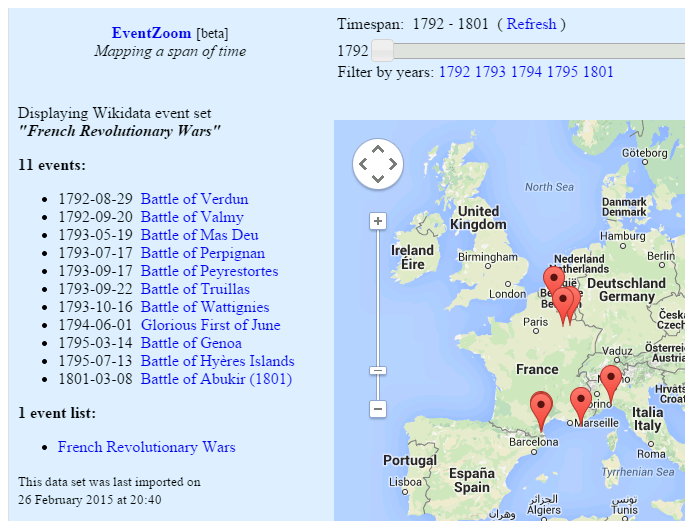 The application displays maps of historical events and is described here. It uses data from WikiData. If you have a Q-ID from Wikidata you can paste the ID and after importing the data the map is automatically generated. The application is written in Seaside on top of Pharo and is hosted on PharoCloud. maybe you already noticed. The latest update for Pharo 5 which is 50103 (see ). includes a new tool called "Catalog Browser". configs together with the catalog metadata like project description. improvements like spotter integration from my side. Feel free to contribute more features. The repository can be found on SmalltalkHub . (see world menu -> "Tools" -> "Catalog Browser". But you can also use Spotter to load a config. gives more informations about the projects. If you want to contribute just tell Esteban so he can add you to the project. 15679 Writing only one quote at the beginning of a method produces a syntax error. 15598 Morphic – Cant go back directly to the first menu when more than 2 submenus are opened.